Cats love to be on top of the most unexpected places around our home. Such behaviour could be linked to their independent and curious nature, which means that they are continuously on the lookout for new spaces where they are likely to feel comfortable and safe. Knowing how much your cat loves his or her comfort, only the best cat furniture will do to ensure they enjoy every minute they spend indoors; and this is when a cat window perch comes in. Cat window perches ensure that cats benefit from both indoor and outdoor living. Whilst indoors, a perch delivers a fantastic view of the outdoors coupled with a comfortable bed your furry companion can stretch and relax on. If you are on the lookout for the best cat window perches, the list below will assist you. From one of the leading producers of pet products, and with an upgraded bolster and cover, the K&H Kitty Sill Deluxe might just be the perfect perch out there. It is engineered to be strong enough to carry up to a weight of 40 pounds and can be installed by simply making use of the provided hook and loop which also makes it very practical for rental living. There is also adaptability in how to use this cat window bed as the bolster has been designed to offer a zip off feature. Also adding to the value creation of this product is a beautiful print design that covers the bolster whilst the sleeping surface has been lined with a smooth velvety microfleece. The cover also offers an anelastic edge that fits around the frame, and can certainly hold up well for years to come. If your kitty enjoys gazing out the window for hours on end, the K&H Kitty Sill Deluxe is perfect for window perch sunbathing and afternoon catnaps. It comes with a large surface area suitable for accommodating two cats. For a more permanent solution, or for attaching to your window sill, screws have been added. All in all, this is a quality product that is easy to install, built to last and with comprehensive instructions. Notwithstanding how much pressure your furry friend put on this cat window seat, it is definitely built to withstand and tolerate such beatings. What’s more, when cleaning, the removable washable cover only requires a gentle cold water wash and air dry. The Oster Sunny Window-Mounted Cat bed offers your furry friend a relaxed place to enjoy being kissed by the sun. Taking into consideration that it is directly mounted unto the window, it is the perfect bed for cats that take delight in high vantage points. It offers a great design that allows the user to save space in their room since it can be securely mounted to a window glass or doors with its four thoughtfully engineered suction cups capable of holding up to 50 pounds of weight. Together with its reinforced high-grade plastic frame and the industrial strength suction cups, this product can be mounted at variable heights of a glass window giving a feeling as if it is a cat window shelf. This cat bed presents your cat with an up close and personal relationship with outdoor life by providing some sort of a front-row view of nature, weather, people and other risky aspects of their life whilst at the same time, saving you valuable floor space. It is a great product for a household that has multiple cats due to the weight it can carry and the engineering of its suction cups as well as the reinforced plastic frame. 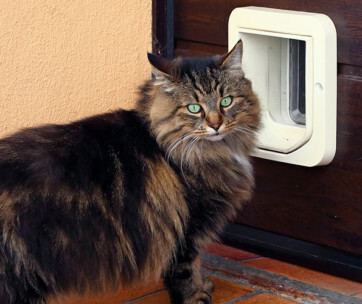 Since it can be elevated and brings cats closer to the outdoors, it is also capable of reducing separation anxiety for cats. It comes with an enduring Oxford-style polyester cover built to withstand scratching and this same cover in addition for easy cleaning can be machine washed. No doubt, both your bed and sofa are among the furniture that your cat prefers, but with the use of a cat perch, you will be directing their attention away from your precious and expensive units to one specially designed to satisfy their comfort. Coming with a patented giant suction cups made in the USA, the Kitty Cot Original World’s Best Cat Perch will enable any prying cat to keep away from your furniture and stay within their confined space. The Kitty Cot is one of a kind cat window perch which is highly recommended for older cats due to the potential of outdoor installation and it comes well-built with a resilient plastic coated nylon mesh commonly used in outdoor furniture. Designed to look like a cat window hammock, this cat perch can hold up to a weight of 25 pounds which can make room for two cuddly cats. This product also comes in three different sizes to serve variable window sizes and user inclinations. If you are more concerned about safety and durability, you can rest assured that the Kitty Cot frame has been designed to be strong and durable with its plastic pipe. What’s more, the fabric has been constructed to be weather resistant which is both comfortable for your cat and easy to clean – the entire Kitty Cot can be taken down with ease for easy and thorough cleaning. It is also very easy to install and can be fitted on either your glass windows or mirrors anywhere in your house at any desired height. All in all, you can be certain that this cat perch will help entertain your pet for long periods. The outdoor aspect of this particular product can enable healthy mental stimulation that will keep your cat young and active for years. Being touted as affordable yet very functional, the PETPAWJOY Cat Bed which is also referred to as a cat window hammock and can be utilised to ensure that your cat takes advantage of those sunny days. This is even more possible given that this cat window hammock comes with four suction cups that are used to mount on the window at any required height making room for space on the floor. This product is covered by an Oxford cloth and can be installed in a matter of seconds, however, particular attention should be given to making the contact surfaces of the suction cups as clean as possible without any dust forming; since it is capable of weakening the bearing capacity. When it comes to durability, it is evident that this product was well thought out as the string is constructed from steel wire to withstand its dedicated weight support of 30 pounds aided by the suction cups. In the instance that the suction cups become slippery, thoroughly clean the area of the window where the bed is to be mounted. Apply water or alcohol to the suction cups to ensure a solid stick to the window. 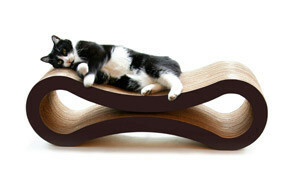 The result will be a structurally stable cat perch for lots of relaxation time for your pet cat. 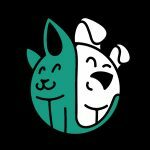 The PetFusion Ultimate Cat Scratcher Lounge, as the name suggests, is the number one product capable of saving you from the destructive outcomes of one of the most inherent behaviours of cats, which is scratching. As a two-in-one innovative product, the Ultimate Scratcher Lounge serves as both a cat scratcher and a cat lounge that promises to keep your furry companions coming back for more. This is an ideal product for all cats given that it essentially depicts usages such as playing, scratching and lounging around; which are all basic instincts or behaviours of cats. It also offers your beloved pets a place to relax and feel comfortable and with an attractive wavy design that blends in with most contemporary interiors, this product helps any owner save cost on furniture or item that might have been destroyed with scratches. It is certainly designed for cat lovers looking to claim back ownership of their homes. 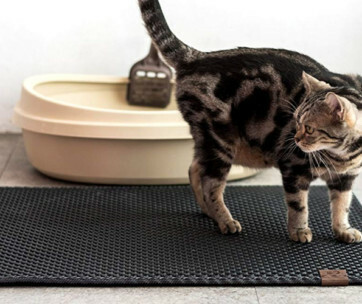 Rest assured that your pet cat will be thoroughly attracted to this product; apart from the pretty design, it is made of more superior cardboard than the traditional ones that most cats are used to scratching. Even better, no assembling is required, rather, it comes as an already made unit. Ever thought of making your cat use your window as an eventual entertainment centre? 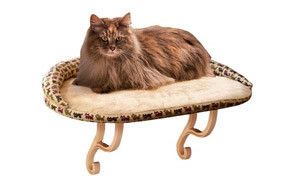 Then the EZ Mount Window Bed Kitty Sill is your go-to product. It affords your cat the essential sunbathing, bird watching and snoozing spot. With a proven suction cup mounting system, this excellent product attaches to most windows. It has been designed with an open top in its pouch-like design to allow cats quick and easy access in climbing in and out of the pod. Inserted in the bed of the EZ Mount Window Bed Kitty Sill is the soft, warm cushy pad to provide cats with comfort and warmth during their catnaps. What’s more, if you are tired of having your furniture full of hair, the sleeping surface is removable and capable of trapping kitty fur or hair like a magnet whilst ensuring that your furniture is kept clean. This product can be mounted anywhere on the surface of the window for better access by the owner. With a very sturdy design of the suction cups, your cat is definitely going to be in a safe place whiles enjoying his or her catnaps and views. Installs to glass windows or doors. Is your cat occupying your space just when you want to rest? Why not head to the EZ Window Mount Kitty Sill? This product pioneers an innovative design that allows you to quickly lay the kitty sill if your pet cat is all up in your personal space. It comes in two models or styles – the single level and double level styles. This is one of the easiest, strongest, most adaptable window sleepers on the market. Just like most cat window shelf products, the EZ Window Mount Kitty Sills bestow upon your cat the opportunity of getting a front-row view of nature, weather, people and more without occupying valuable floor space. Cats thrive on having a high vantage point and certainly, the double stack type offers such an advantage with an added bonus of aiding in keeping messy fur from your furniture. This creation from K&H introduces a push and turn suction cups and giant push cups mechanism for ultimate strength. It also offers a removable cover that can be taken out without having to uninstall the kitty sill. Additionally, the frames are constructed of fine steel for ultimate strength and style creating a streamlined look – which is unlike other similar products made of PVC pipes on the market. The Foam Cushion Deluxe Kitty Window Perch is a simple cat window perch for those cats that love a good sunbathe every now and then. Its intelligent design means that it can be supported at the window sill with 2 support brackets and 2 velcro style fasteners. It is definitely the choice if you would rather do away with the obstructions caused when a cat window bed is mounted with suction cups; therefore, ideal if a clear window surface is needed. This cat perch comes as a safe comfortable product for your cat since it has been built with a soft removable and comfortable fleece cover. It also offers a large surface area capable of taking on more than one cat at a go and although the 2 brackets can easily beattached to window sills, additional screws are included which can be used to ensure extra stability in situations where necessary. This product is easy to assemble and install and as such, it is highly recommended for rental properties as it offers easy removal when moving out. This is unlike some other suction cups that lose their sticking ability upon several removals from their mounting surfaces. Cats generally like to move about in the home but with the LAZY PET Window Perch, your cat can be subdued to adjust to a more comfortable relaxed environment as it enjoys what nature has to offer. The soft cover of this perch ensures that your beloved pet will be cosy enough. You also will love the idea that it can be removed with ease for washing as well as the fact that a replacement cover is also offered to keep the product in good condition. As for installation, that’s a breeze as the perch is easily installed with the use of fastening strips that bond it to your window sill while the legs sit on the wall for support. Secured fastening is achieved for 8 hours after which the weight can be applied; as maximum sturdiness would have been achieved at this point. 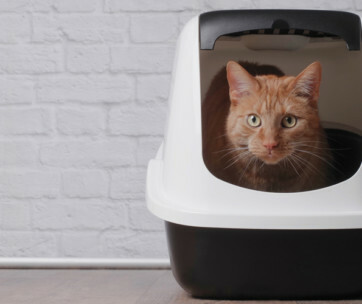 The product can support up to a weight of 25 pounds and also comes in two sizes for single or multi-cat households. Overall, it offers a conducive place for your cat to observe the world and enjoy long afternoon snoozes. 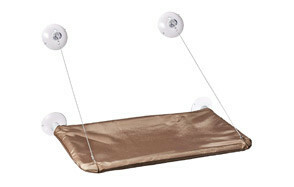 The Raytop Cat Window Hammock is made of industrial strength suction cups for maximum fastening and is capable of carrying weights up to 60 pounds; with the help of its super sturdy PVC tubes and plastic coated stainless steel cables that provide outstanding stability. It can be mounted at any level on the window which allows for space saving on the floor. Although it offers industrial strength suction cups, it is recommended that windows are kept clean to avoid adhesion failure of the cups. In case this happens, you are simply required to place the suction cups in warm water for 2-4 minutes for them to regain their power. This cat window hammock bed is large enough to accommodate cats of variable sizes and can even carry two or more at a time – so far as the total weight does not exceed 60 pounds. Another beneficial feature is the machine washable, weather resistant fabric cover which is easy to remove and has been built to withstand scratching. Upon all these wonderful aspects of this quality product, it is easy to assemble without any stress. In the end, a comfortable cat on a sturdy perch is what you get at home. Cats spend an average of 2/3 of the day sleeping. This means that a 9-year-old cat was awake only three years of his life, crazy right? If you are a cat owner, this information may not come as a surprise, hence why you are on the lookout for the best cat window perch to help maintain their comfort. We have created the buying guide below for further information on the features to lookout for. Before purchasing a cat window bed, it is essential to first consider the type of window the perch will be placed. Not all windows can are suitable for cat perches. For example. double pane windows offer a double layer of glass, thus, they are more suitable for perches built with suction cups. Single pane windows,on the other hand, are best paired with cat perches that are built with leg supports. Such designs are mounted to the window sill rather than being attached to the glass. The size of the perch is another important aspect that needs checking to ensure that it can be comfortable for your cat. Furthermore, the weight capacity must also be thoroughly checked especially if you have one or cats in the household. This way, you will be certain that perch can safely handle your pet's weight. It’s also vital to measure your cat before purchasing. Especially is kittens are in the house, opt for a slightly larger perch to accommodate them while they grow. Your cat’s comfort is another important factor. As most cat perches offer orthopaedic foam, you can rest assured that they are unlikely to deflate over time due to excess weight. Some other perches are designed with a slightly stretchy material for added comfort. So, it’s best to monitor your cat’s sleeping habit and opt for a perch that closely mimics that style. Be sure that the perch you opt for is durable and able to withstand the weight of your pet, especially if more than one cat will make use of it. If suction cups are in place, ensure they are strong enough not to slip off once your cat hops on the perch. Vitamin D deficiency is very common in cats that spend too much time indoors. Hence the importance of allowing your pet cat to sit long enough by the window offering them their daily dose of vitamin D from the sun. In biological terms, the brain of a cat is more similar to that of a human being than that of a dog. Both humans and felines have identical brain regions that are responsible for emotions. When it comes to mental health and stimulation, window perches are the best option as cats thoroughly enjoy observing all the happenings outdoors in their own comfortable space. Their brain will be kept active, preventing the occurrence of anger or anti-social related behaviour. But most cats are free-range. They sleep at night in the house and during the day they are in the garden, or on the window sill. A cat bed is, therefore, necessary to provide your pet with enough comfort through the day. Hammock style cat bed includes a longed lined material supported by a frame. This cat bed is designed in the shape of a box and tends to offer up on room for multiple cats. The pod cat bet is designed with an upper part open to enable movement. These are typically designed to aid with scratching and relaxation. Un-box the various components of the cat window hammock. Fix the cover cloth around the PVC pipes accordingly. Clean the suction cups thoroughly and fix them to the ends of the PVC pipes and the cables where appropriate. Clean the glass pane and sill thoroughly before mounting. Ensure that any layers of dirt are completely removed from the surface to enable the suction cups and adhesive tapes to stick. Fix the suction cups unto the window surfaces. Q: What is a Cat Window Perch? A: A cat window perch is essentially a bed or hammock placed in front of a window that comes in different forms. Q: Why Do Cats Like Sitting In the Sun? A: Cats mostly enjoy relaxing in the sun as this helps to create a balanced body temperature whilst enabling the production of vitamin D.
Q: Where Should I Put a Cat Window Shelf? A: A cat window shelf should be placed by the window where there is enough ingress of sunlight to be enjoyed by your pet. If possible, it should be elevated to make room for more floor space. The elevated height also gives a vantage point as it’s common for many cats to take delight in relaxing in high surfaces; high enough for them to spot preys and predators alike.